This article was originally written in May 2007 for the food & drink website Taste T.O., and republished here in October 2011 (but back-dated to match the original publication date) after Taste T.O. was shut down and taken offline. As noted in this column a month or so ago, I’m quite a fan of Hockley Dark, an authentic UK-style brown ale brewed by Orangeville’s Hockley Valley Brewing. So when I caught wind earlier this year that they were planning a dry stout to be released for St. Patrick’s Day via the LCBO, I was obviously very interested to try the results. Well, they missed the St. Patrick’s Day target by a month or so, but Hockley Stout finally started appearing on shelves a couple of weeks ago as part of the LCBO’s spring beer promotion. And having now tried all six of the beers in the rather meagre little release, I’m happy to declare this stout to be the best of the bunch. In fact, I might go so far as to say that this is a quintessential example of a dry stout. Although the style is pretty rare around here, so aside from Guinness, there’s no real point of comparison. It has a deep black body with ruby tints and a massive off-white head that recedes fairly quickly. The aroma is mild and malty, with notes of wood smoke, coffee and vanilla, and the body is a bit thin, but has a slight creaminess which is nice. The flavour is full and very solid, with all of the characteristics I expect from a dry stout – good maltiness, a bit of coffee and smoke, and a dry, faintly soured finish – and the fairly low alcohol (4.2%) is right on the mark for the style as well. Quite frankly, this is the beer that Guinness wishes it could be. My only complaint about this beer would have to be the package format and price point. It’s offered in a 1 litre swing-top bottle which is attractive and distinctive, but which might be a bit off-putting to a curious customer who has never tried it. And even more off-putting is the $9.95 price tag. While I’m all for craft brewers charging (and hopefully getting) what their beers are worth, a price that translates to roughly 20 bucks for a six-pack worth of beer is bound to be a hard sell in a market where “buck-a-beer” is a popular buzzword, and the fact that this appears to be the slowest moving of the seasonal beers seems to prove that point. Then again, it also translates to around 5 bucks a pint, which compares more than favourably to the draught prices at most of the city’s better beer bars. So why not look at it that way and treat yourself to a bottle or two of one of the best stouts to hit LCBO shelves in quite some time. And in the meantime, I’m keeping my fingers crossed that Hockley is able to come through on their plans to add the stout to their regular line-up this fall in less intimidating and more reasonably priced 500 mL cans. 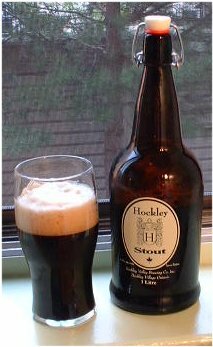 This entry was posted in beer reviews and tagged Hockley Valley Brewing, Ontario, stout. Bookmark the permalink.